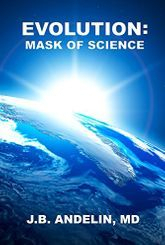 Originally copyrighted in 2014, Evolution: Mask of Science is a 450 page book that systematically dismantles, piece by piece, the theory of Evolution. It begins by an explanation of the scientific method, with examples of how evolution does not meet the minimum criteria for science. Next, the fundamental evidences used to argue evolution are each examined, and it is documented that these are not scientific evidences, but philosophy-based. In subsequent chapters, the impossibility of evolution is explained, including a chapter of probability that is understandable to those of average education. For many years I questioned the plausibility of the theory of evolution. When I entered undergraduate studies, I took classes in biology in which it was authoritatively declared that evolution is true. The evidence was presented in a compelling way. I wanted to know the truth. I spent a great deal of time and effort in researching what have been set forth as the most compelling evidences for evolution. I devoted much less time reading rebuttals by creationists. The reason I decided to write this book is because, despite the many books and articles already devoted to this controversy, I realized that I have some unique ideas and perspectives that as yet haven’t been published. It has been my intent to make this writing as easy to understand as possible, while at the same time offering compelling scientific challenges to Darwinism that will be taken seriously by intellectuals who have devoted their lives to naturalism. To those who do not understand all the arguments pro and con, I would urge you consider the fact that the theory of evolution has been an indispensable foundation for the worldview of secular humanism for 160 years. Despite the fact that evolution is portrayed as “science, great effort is being made to shield evolution from criticism. There is a common thread that I’ve noticed in reading books and articles in favor of evolution. Generally, those who promote evolution present only what they deem compelling evidence, and address only the weakest challenges. Invariably, serious logical inconsistencies to evolution are not addressed. In my book, Evolution: Mask of Science I’ve chosen a different approach. I have presented what I feel are the most compelling evidences for evolution, and I’ve squarely addressed them. I then present the impossibilities to evolution which have not been adequately acknowledged by those who promote evolution.